After reading Al Mercer and Rich Williams' recent post (see original post link here) for this strange looking bird from Olympic Centennial Park , I was in doubt how a bird native to Brazil and was introduced to Hawaii in 1930, showed up at our local park. Saturday evening, I read another email posted by Gus Kaufman, Jr., I decided to try my luck on Easter to see if I can find this beauty. With Gus's wonderful help on direction, where to park and how to get to the possible sighting location, I marched to COP on Sunday morning . Gus mentioned he saw the bird at around 11:30 AM, I know I have to be at the park no later than that time point as bird's behavior is often predictable, this escapee's appearance is a wonderful surprise to all birders. Linda, It was your lucky day! Fabulous capture of this striking bird. I will try to get down to COP soon! I spotted 2 of these on 4-12-12 in my backyard in Kennesaw GA.
Have you reported your sighting on ebird? Or if you have taken pictures? 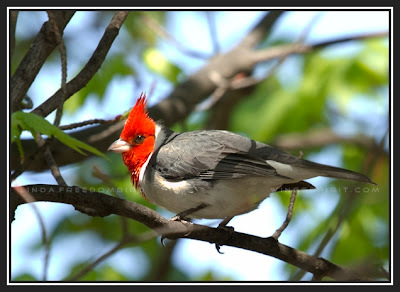 Red-crested Cardinals are not sexually dimorphic so they are very likely to be a pair! Are these birds still around? Going to be heading from West Tn to East Tn soon and would be willing to think about making a detour if they are still around. HossC, I am sure she is still there. If it's not too much trouble for you, I will encourage you to stop by the park. Good luck!